Fall is a wondrous time of year. The leaves change color, the weather becomes cooler, and it is the perfect time to update your home’s decoration. With items such as pumpkins, gourds, scarecrows, wheelbarrows, and candles, there are countless ways to get your home ready for the season. The team at Hardwood Lumber Company picked out a few of its favorite projects you can do at home. Here are eight fall decorating ideas you can use for your home. The Native Americans introduced Indian corn, or “flint corn,” to the first colonists. Indian corn kernels traditionally come in one color but can also have a vibrant arrange of colors and patterns. This is a simple and easy fall decoration, as Indian corn can be displayed in several locations inside or outside of your home. A pumpkin patch is a traditional choice. Plot bunches of pumpkins out on the front lawn, line the porch stairs, or add a couple just outside of your front door. In addition to the conventional orange pumpkin, we recommend incorporating some ivory pumpkins as well for a delicate, contrasting style. Put together an array of different shapes, sizes and colors to complement the yard and home. 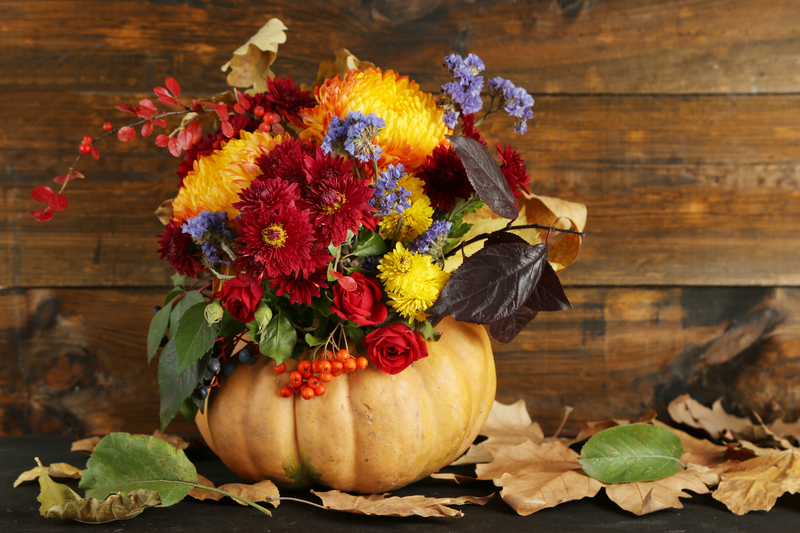 This year, create an arrangement of real or faux flowers, leaves, berries, twigs and any other piece that showcase the beauty of fall. Combine these elements to make a wreath, candle holder, a bird’s nest, or more! A bountiful centerpiece can make a bold statement on a dining room table. During the fall harvest season, there are more food and drinks served than any other time of year. With so much time spent with guests at the dining room table, take the opportunity to decorate it as well. Impress your guests with fancy napkin folding, decorative placemat, and your finest china. Room lighting and candles are a great way to enhance the ambiance and hospitality. Roll some rustic flair into your yard with your favorite wagon or wheelbarrow. Put some hay into the bed and add some pumpkins on top. This will make a wonderful addition to your lawn this fall. To combat the chilly fall weather, keep it extra warm in the living room with your fireplace. Aside from providing extra warmth, the fireplace can be used for decoration as well. Instead of hiding chopped logs in storage, keep them in view on the fireplace deck. Finish off the design with a maple leaf garland hanging from the mantle. Enjoy the crisp fall air with a book in your hand on a porch swing. Swings are perfect for relaxing, entertaining, and most importantly, decorating. A porch swing adds a touch of rustic, romantic charm to your home and are usually easily assembled. Be sure to select a porch swing that fits with your home’s overall fall design. A scarecrow display is the perfect addition for both Halloween and Thanksgiving. They bring personality into your home’s décor along with that classic fall harvest appeal. Visit your town’s local fall festivals or apple farms for inspiration on how to add a scarecrow to your home!